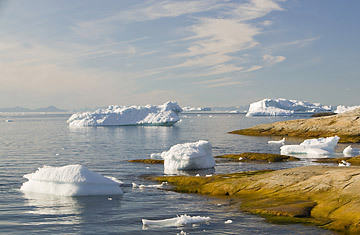 Icebergs that have broken away from the Jacobshavn glacier in Greenland. Is There a Climate-Change Tipping Point? Climate change is happening everywhere, but nowhere faster than in the Arctic, where annual temperatures in the far North are warming twice as fast as the rest of the globe. Sea ice on the polar cap is shrinking and permafrost is melting, putting animals like the polar bear  and the Arctic people who depend on them  in increasing danger. While there's no doubt that the Arctic is warming  year after year, it becomes more clearly visible  it is actually a new phenomenon. In a new study published in the Sept. 4 Science, researchers led by Darrell Kaufman at Northern Arizona University and the National Center for Atmospheric Research constructed a climate record of the Arctic over the past 2,000 years, and found that the region had been cooling for almost all of that time period. Summer temperatures in the Arctic cooled by an average of 0.2 degrees C each thousand years, thanks chiefly to wobbles in the Earth's orbit around the sun that gradually reduced the amount of sunlight hitting the Arctic. Left unchecked, the Arctic would have continued that slow cooling for thousands of more years, until the Earth's orbit wobbled again. But then something else happened  us. The Science researchers found that during the 20th century, as human beings began pouring greenhouse gases into the atmosphere, the Arctic stopped cooling and started warming. Even though the Arctic is still gradually getting less sunlight, it's still getting hotter  summer temperatures in the Arctic are 1.4 degrees C higher than they would have been if the cooling had continued unabated, according to the study. The most recent decade recorded  from 1999 to 2008  was the warmest of the past 2,000 years. The recent warming trend has been so strong that researchers say it might have even kept the Earth from slipping into a new Ice Age  although now, of course, the world needs to deal with the opposite problem. Another study released this week by the World Wildlife Fund (WWF) examines that problem and its potential future effects  and it's not pretty. The WWF researchers found that Arctic sea ice is melting at a faster rate than expected, and that the massive land sheets in Greenland and parts of Antarctic are vulnerable. The report predicts that global sea level will rise more than 3 ft. by 2100, significantly higher than scientists had previously believed. "What we're finding is truly sobering," says Martin Sommerkorn, the senior adviser for the WWF's Arctic Program. The study also found that the methane locked in Arctic permafrost is increasingly at risk of being released if warming continues  a positive feedback cycle that would accelerate climate change. But the impacts of a hotter Arctic go beyond that. The WWF study found that as the Arctic warms, it could alter weather patterns beyond its borders, affecting temperature and rain patterns in Europe and North America. "The Arctic is the global refrigerator for the climate system," says Sommerkorn. "Change it, and you might see even more dry summers in the Southwest and wetter winters in the Mediterranean." It's another reminder that in this season of climate change politics, we're running out of time to make a difference.